MTA, a company known for the development and production of a wide range of electromechanical and electronic products for major OEMs, is presenting the new 8” color TFT Giotto and Giotto K customizable displays. Both developed in-house with an Android-based software, Giotto and Giotto K are engineered to reach outstanding performances in the most hostile operating conditions. 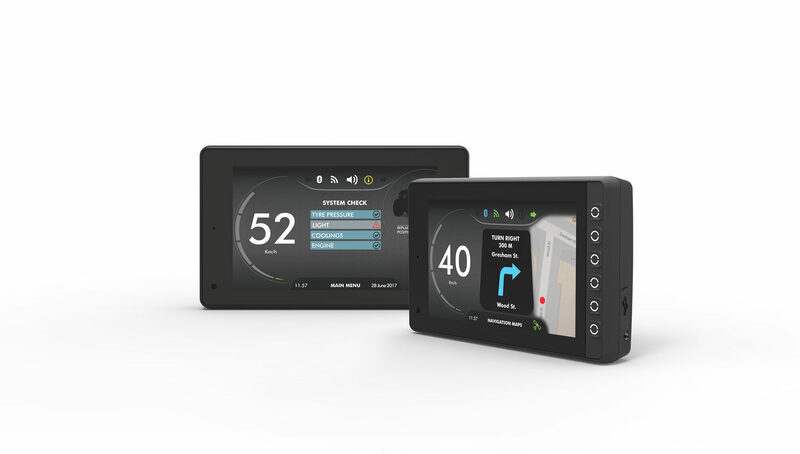 In the off-highway industry, OEMs requirements are more and more demanding; they are focusing on high-performance displays that combine an evolved and user-friendly graphical interface, similar to those typical of consumer electronics, with cost-effectiveness as well as the possibility to adopt it on multiple platforms. To meet the OEMs needs, MTA developed Giotto and Giotto K displays, two off-the-shelf products already programmed with basic software that can be implemented by OEMs using software tools that allows for deep customization. Giotto is a full TFT touch screen display while Giotto K is a product that combines a TFT display with a side keyboard, for customers who prefer a more traditional approach in interacting with the display. Both Giotto and Giotto K can be used as stand-alone devices or in addition to other dashboards or instrument panels. The introduction of Giotto and Giotto K displays confirms the expertise of MTA in vehicular electronics field; the company is able to meet the requirements of the OEMs with both custom-made products for large-scale productions and off-the-shelf products for niche applications, that can be easily customized even by less experienced users thanks to the latest generation of software tools. To ensure fully functional levels and operational reliability even in harsh conditions, sophisticated off-highway technical features are included in Giotto and Giotto K displays. MTA equipped Giotto and Giotto K with an anti-reflective and anti-fingerprint glass that ensures maximum visibility. Special treatments, eliminating the air between the glass and the plastics, improve the performance under outdoor environments, increase ruggedness and durability, eliminate condensation, extend the temperature range and minimize light reflection. The materials and design solutions chosen for Giotto and Giotto K guarantee an IP66 degree of protection, as well as high resistance to vibrations and extreme temperatures. Giotto and Giotto K have a 12V or 24V power supply and they both use the Jacinto 6 processor by Texas Instruments that ensures power-up time of less than 5 seconds. The two displays are equipped with up to 8 analogue/digital inputs; up to 2 frequency inputs; 2 video inputs for cameras connection; 2 CAN ports; 2 USB ports; 1 loudspeaker; and 2 power outputs that allow the display to manage external functions, thereby replacing an additional control unit for a simpler vehicle configuration. Giotto and Giotto K displays allow a high customization level. The Android platform on which they are based includes standard features like graphical elements and algorithms of reference that facilitate the developments of applications, so that customers can easily customize the device to meet the specific needs of the vehicle on which Giotto or Giotto K will be installed. As well as the Android Studio environment, Giotto and Giotto K can also be programmed with MTA Studio, a tool developed in-house by MTA’s electronic division for even novice users. The software allows the customers to customize the display according to their needs, thanks to its exceptional configurability, as well as its programming with C/C++, LADDER (Livelihoods and Diversification Directions) and FBD (Functional Block Diagram) for the operating logics. The graphic Human to Machine Interface is What You See Is What You Get allowing the user to see how the graphics will appear at the end of the job even while building the application itself. MTA Studio also contains a real-time debugger and a set of libraries, with different functions available, which the customer can decide to use depending on the application requirements.